Scientists have developed a tiny cantilever that can weigh individual cells, which has enabled them to detect that a cell stops growing after catching a virus. Researchers from the MRC Laboratory for Molecular Cell Biology (LMCB) at UCL say the project shows how international collaborations between biologists and technology experts can drive new discoveries in biology. The study, published in Nature, was led by biophysicists from Eidgenössische Technische Hochschule (ETH) Zürich. They collaborated with the researchers from the MRC LMCB, who contributed biological expertise on how viruses interact with cells. Existing technologies can weigh cells that are floating in liquid, but this does not mimic the normal state of cells in the body. Most cells in the human body are joined - adhered - to their surroundings. 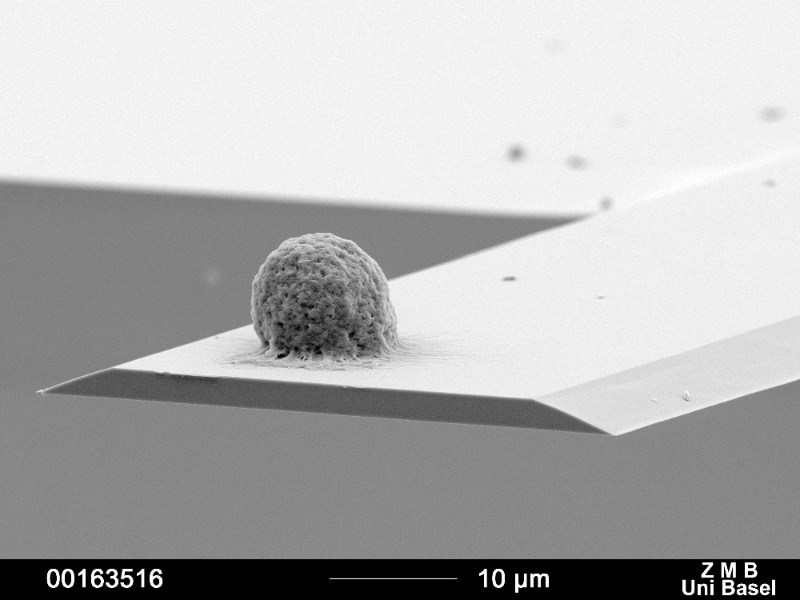 The new device precisely measures the mass of a single cell adhered to a cantilever and if that mass changes over small periods of time. The mass of the cell affects how the cantilever resonates and this resonance is measured by lasers. The physicists use this resonance to calculate the mass of the attached cell. The cantilever can detect mass changes at a picogram level, which is a trillion times smaller than a gram. Professor Daniel Müller, from Department of Biosystems Science and Engineering at ETH Zurich and senior author on the paper, said: "So far it has not been possible to measure the mass of adherent cells, which most human cells are. Our cell balance allows the mass of single adherent cells to be measured at an unprecedented time (millisecond) and mass (picogram) resolution over the time course of days and under cell culture conditions." The scientists found that a living cell continuously went through small, regular fluctuations in mass. The uptake and expulsion of water by the cell and energy production within the cell contributed to these fluctuations. Professor Müller added: "We anticipate that the cell balance will open the door to a more quantitative understanding of cell growth and homeostasis. This device allows us to watch the mass of a cell going through the cell cycle and even follow the growth of tissue. It will help us to understand conditions where these processes become deregulated, such as in cancer, adiposity or hypertrophies." Dr Jason Mercer, from the MRC LMCB at UCL and author on the paper, said: "The mass of a cell is largely composed of the building blocks it uses to make new proteins, carbohydrates, and copies of its DNA. Knowing how a cell's mass changes under different conditions, be those beneficial or deleterious, can tell us about the general 'health' of a cell." "This technology can be used to measure and understand how cell physiology is changed by disease states, such as cancer, and by pharmaceutical drugs. We're constantly trying to use new technological developments to uncover novel biological phenomenon and since we're not experts in engineering and physics, we often achieve this through technology-based collaboration." The researchers demonstrated the effectiveness of the new device by infecting a single cell with vaccinia virus. Vaccinia is the laboratory model for poxviruses, and is best known as the vaccine used for the eradication of smallpox. They mimicked natural infection by lowering a cell infected with the virus close to the cell on the cantilever, until the infection spread to the uninfected cell. The virus was genetically engineered with green fluorescence protein, so once the cell was infected it glowed green. They showed that while uninfected cells continued to grow and gain mass, infected cells stopped growing. The researchers suggest that the virus may halt the cell replication cycle to help it grow inside the cell. Dr Mercer said: "While much is known about how virus infection changes cell shape, the impact viruses have on cell mass and how this affects cell physiology has never been explored. We found that poxvirus infection alters cell physiology to the point where cells can no longer grow or divide, suggesting that the virus is very efficiently stealing all of the cell's resources." Dr Karen Brakspear, MRC Programme Manager for cell biology and physical sciences, said: "This study is a great example of how interdisciplinary collaboration can lead to innovative technologies that open up new opportunities for discovery research across the life sciences. We are currently fostering such research through Technology Touching Life, a joint initiative of BBSRC, EPSRC and MRC, which aims to encourage engineering and physical sciences researchers to work in partnership with health and life scientists to developing the next generation of advanced life sciences tools." The study authors received funding from the Swiss Commission for Technology and Innovation, the European Molecular Biology Organization, the Swiss Nanoscience Institute Basel, NCCR Molecular Systems Engineering and the Medical Research Council.